Raised by foster parents on a farm in Minnesota, Albert Faille ran away from home at the age of eight and began earning money doing odd jobs on farms. By the time he was ten he was living in an abandoned shack in rural Minnesota and this is where he learned the craft of trapping. In 1917 he joined the U.S. Forestry Engineers and served with them in France during the First World War. After the war Faille returned to Minnesota and once again became a trapper. By the 1920s the Minnesota wilderness was trapped out so in 1924 Faille headed north to try his luck around Great Slave Lake (map) and Faille’s luck was very good! During his first two seasons in the north he earned $10,000, a small fortune in the 1920s. In 1926 Faille moved to Fort Simpson and for almost forty years spent his winters on a nearby trapline and his summers on the South Nahanni River searching for gold. Faille based his belief there was gold somewhere up the South Nahanni River on information from Bishop Brenner of Fort Simpson. The Bishop claimed that prior to 1900 a Dene named Little Nahanni gave him several gold nuggets that had come from the upper reaches of the river. Faille’s search for Nahanni gold became his life’s work. R.M. Patterson wrote about Faille’s persistence in his 1950s book “Dangerous River”. Faille’s fame continued to grow in the 1960s with his appearance in the classic NFB film called “Nahanni”. Radio interviews, newspaper and magazine articles, and television shows all added to the legend of Albert Faille. This publicity drew the attention of Prime Minister Pierre Trudeau, who made a trip by airplane and riverboat to the Nahanni to meet Albert Faille and to see the famous South Nahanni valley. It wasn’t too long after that trip that Nahanni National Park was created. Albert Faille died alone, in his cabin in Fort Simpson, either on New Year’s Eve 1973 or on New Year’s Day 1974. 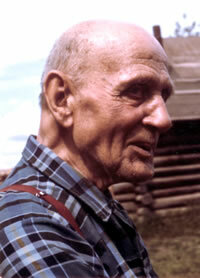 As a tribute to this northern legend the Fort Simpson Historical Society preserved his cabin just as he left it. Albert Faille in the 1960s.